The time I wore electric blue and leopard prints, shared thoughts on seasons and the mind. We finally got to do a short shoot in between the rain sessions that have been happening here on the daily in old Malaysia. I was never been so happy to see a peek of sun while the clouds parted so tentatively for a bit until today and made an appointment with my reluctant photographer. She had a headache and still managed to be a darling, I’m forever in gratitude to you, mama! The kind of rain that has been falling here this season is kind of peculiar in a way. It’s what I would call a creeping type of drizzle, that gently drips over roofs and if you’re buffered by the digital noise like the modern human, you won’t even know that it is there. The thunders are mild which I am grateful for because the loud ones last year or the year before were monstrous. Even though I’m not afraid of lightning like my cat, Aiden or my mom, the sound of a loud clapping thunder can quite test you. Rambling on the weather aside (which is my specialty), I want to pinpoint something I observe about seasons. We may love certain seasons and it’s a matter of individual preference, but if we pause for a bit, we can see that seasons unfold quite naturally that to have a preference over one dismisses other seasons. There is no such thing as having a sunny day or a gloomy one forever. The monsoon comes and it goes. The snow hugs your homes, trees shed their leaves and colors transform and suddenly, the sun is on your face and birds are chirping in your ears, on and on, this shall go in a loop, for certain, from before we existed and long after we’re all but recycled dusts. Compare this to the many states of mind that we have. The thoughts and emotions that breeze by into the space of our consciousness, they are essentially fleeting. The insecurities once faced, get transformed, and they fall away. If you can find peace in the transience of things, whether it is in nature or within your mind, you know you have the power to appreciate all things regardless. Then, you can see, feel and experience things as they are and not what your mind expects them to. You can let go. You can be free. Okay, on to the matters of UTMOST importance that will add intense quality to your life: Which is what I was wearing this fine evening even though tiny blobs of water dropped on my face. I chose an electric tunic top that is humongous. Even thought it’s size M, you know you can’t ever trust in sizing anymore online but make do with whatever you’ve got. This top has a large boxy construction which can be worn as a dress by itself, but I get super cold and the hairs on my legs will stand up and harass people (which I’m so not about!) so I opted for my old leopard print leggings to wear underneath. To have a bit of a curve, I stole my sister’s bow belt and pop it around my waist. The pops of teal blue on my nails worked with this blue top. I had turquoise blue toenails too but you can’t see because they’re in the shoes. My earrings were blue and awesomely triangle, but I forgot to get them snapped. I’m clearly most efficient at OOTDing, I know. My hair was in its natural format. I air-dried it with my old fan on maximum because the hairdryer went kaput. Shoes, are those darn shoes again, which I love. The bunching phenomenon with the top – that made it look overly gathered and voluminized - was because of me, tugging it this way and that, because the belt disturbed my flow. I don’t ever do the cinch, but my advice would be to pick a skinny belt because, the wide ones like the one I’m wearing will bug you out after eating at a shop that gets hot because bodies and curries. Well, they don’t pour curries on bodies, mind you. It’s an Indian food spot, so the curries go in the hole on your face. I like the pop of electric blue (even though I wear it rarely, blame it on the heat-trapping fabric) and apparently my kind waiter at the diner I go to all the time was impressed too, which made me beam. It was a cold day, so this blue was pretty in-your-eyeballs, it got some people to wake up. I felt so blah and ready to hibernate because of the gloom but whenever I saw the blue on my own top, I felt energized, so yes, colors do impact the mood of the wearer and the onlooker. Never ever dismiss that! 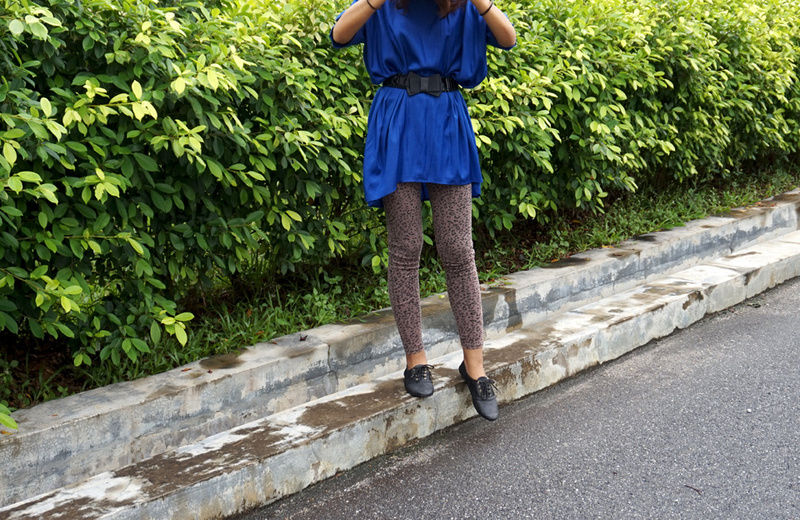 So, what do you think of this blue-leopard outfit of mine? Share your thoughts – I love reading them so much and appreciate each one! Everything is passing ... enjoy its momentariness.